Band performance times and the initial brewery list have been announced for 98KUPD's BRUFEST presents Sabroso: Craft Beer, Taco & Music Festival powered by Gringo Bandito April 15 at the Fear Farm Festival Grounds in Phoenix, AZ. 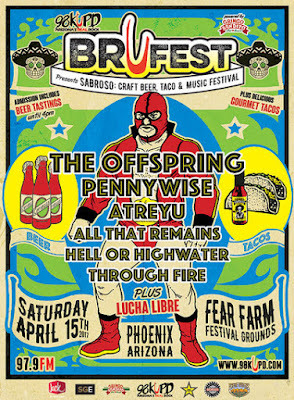 BRUFEST will feature live music from The Offspring, Pennywise, Atreyu and more, plus gourmet tacos, complimentary craft beer tastings (until 4:00 PM) from some of the best breweries in the country, lucha libre style wrestling, and free samples of Gringo Bandito – Dexter Holland of The Offspring's top rated hot sauce. The festival comes hot on the heels of the sold out Sabroso: Craft Beer, Taco & Music Festival at Doheny State Beach in Southern California on April 8. Tickets for Arizona’s Sabroso are still available at: https://brufest.frontgatetickets.com. BRUFEST presents Sabroso runs from 1:00 P.M. to 10:00 P.M. on April 15, with VIP and Early Entry beginning at Noon. Those with VIP tickets will enjoy an extra hour of complimentary exclusive tastings in the VIP lounge. Guests under 21 may enter at 4:30 P.M.
Tickets for 98KUPD's BRUFEST presents Sabroso: Craft Beer, Taco & Music Festivalare on sale now at brufest.frontgatetickets.com. Tickets start at $49 for General Admission. Early Entry Tickets are $65, and VIP Lounge tickets, which include a VIP front-of-the-stage viewing area, are $125. All tickets for guests 21+ include craft beer tasting until 4:00 PM. Parking will be available for $10 per car and a ride share dropoff and pickup area will be located near the festival entrance.